process classification framework - APQC would like to acknowledge the contributions of the various The APQC Process Classification Framework is an evolving model, preview Download... Part of the APQC Process Classification Framework (APQC). Whether this identification of functions starts with a reference model or not, it involves many interviews with different people in the organization. The previous QGEA Business Process Classification framework was adapted from version 2 of APQCs framework. As APQC is now up to version 6, we have created a guide that shows the differences between version 2 and 6 (PDF, 2714.04 KB) of the framework. 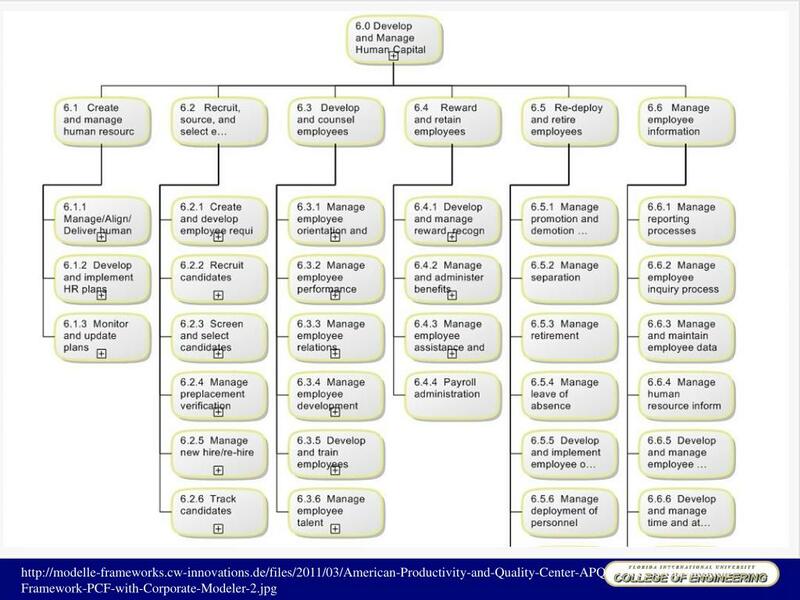 Description* APQC's Process Classification Framework℠ (PCF), at its simplest level, is a list that organizations use to define work processes comprehensively and without redundancies. 29/08/2007 · In 2004 APQC published the Process Classification Framework. The Process Classification FrameworkSM (PCF) is a taxonomy of cross-functional business processes intended to allow objective comparison of organizational performance within and among organizations.